This delightful Vader toaster has settings that range from "Lukewarm" to "Owen and Beru"
Each Star Wars Toaster is molded in sturdy black plastic and meticulously detailed to look Darth Vader's helmet (minus the very top bit). It makes an imposing addition to any kitchen counter. Pop in two pieces of bread, frozen pancakes, hamburger buns, Alderaan muffins, or whatever, and in moments Vader ejects them with "Star Wars" toasted onto one side. Like your toast on the darker side? A handy dial provides temperature adjustment. 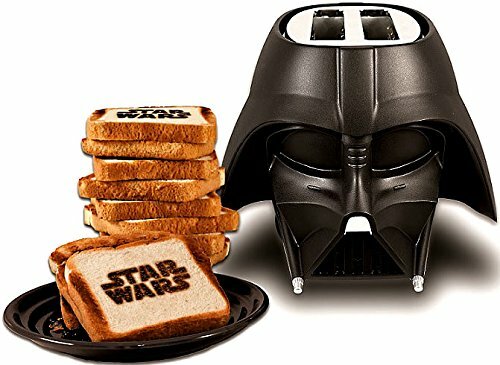 With the imposing presence of Darth Vader, the Star Wars Toaster will help eaters start their day feeling ready to take over the planet, and anything else that might get in their way. Product Specifications Star Wars Toaster that looks like (most of) Darth Vader's head! Toasts: Bread, Waffles, English Muffins, Toaster Pastries, etc. Toasts "Star Wars" on one side of the bread Compact Two-Slice Toaster with Cool-Touch Housing Reheat, Defrost, and Quick Stop Functions Adjustable Thermostat Automatic Manual Switch-Off Removable Crumb Tray for Easy Cleaning Power Supply: 110-120V 60Hz 570-680W Officially-licensed Star Wars food device Materials: Plastic exterior Weight: approx. 4.1 lbs. Dimensions: 12" x 10.7" x 8.4"